Shown here surrounded by toys at a family picnic, Martha Stewart's One Bowl Chocolate Cupcakes and Beatty's Chocolate Cake from Ina Garten were combined in a multi-layer cake. Photos courtesy Deep Media. As anyone familiar with the recipes and columns featured on this site might assume, I am pretty much my family's unofficial baker. One could also rightly assume, seeing my penchant for chocolate, that this fondness might run in the family. And so, with birthdays, anniversaries, graduations, family reunions and all other manner of festive events, I bake a lot. Not that I am complaining; far be it in fact. Sometimes there is nothing I would rather do than to pull out my beloved mixer and spend the afternoon measuring, beating and baking. Nowadays I am most often aided by the efforts of my rather endearing assistant, who particularly enjoys sifting dry ingredients and feels it his birthright to lick the bowl whenever possible. But I digress. Back to the chocolate. 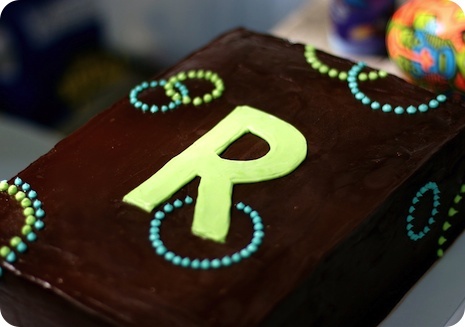 Since this love for all things to do with the cacao bean seems to be part of our familial DNA, chocolate cakes are often the request for our celebratory events. 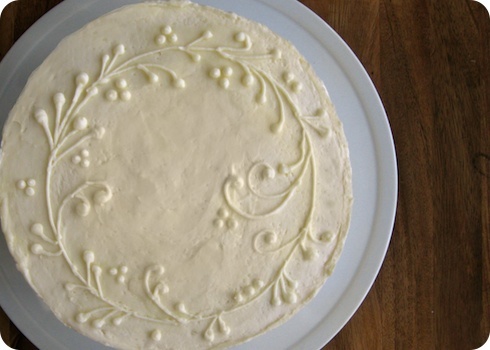 Every time I am asked, these words activate my June Cleaver gene; I become consumed with the desire to make the most delicious, most gorgeous, most towering creation of irresistible, indulgent cake and decadent frosting imaginable. 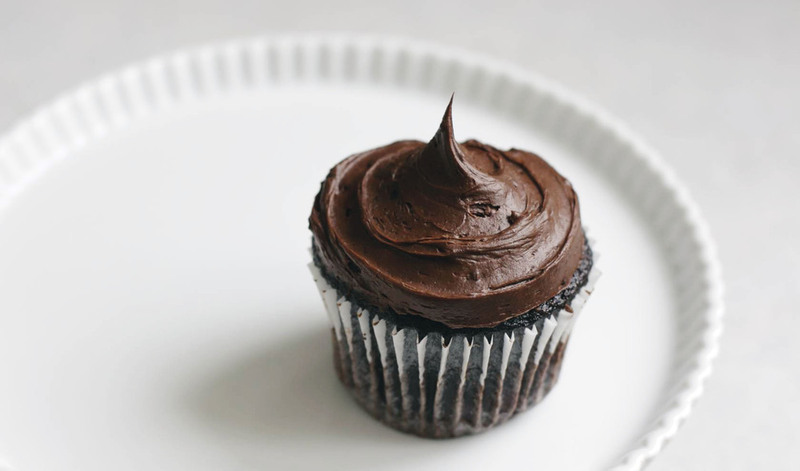 A few years ago I started making the One Bowl Chocolate Cupcakes from Martha Stewart's Baking Handbook to satisfy this task. They were met with resounding accolades as everyone proclaimed them to be the "best ever." I made these for picnics, frosted with chocolate buttercream and decorated with accents of Martha Stewart's signature jadeite green. Truly a one-bowl wonder, I made them in a layer cake variation for a joint birthday party and was later told tales of attendees fighting over the last slice. Then along came Beatty. I never met her, but was introduced to her legacy by Ina Garten on the show The Barefoot Contessa. It seems that this wonderful woman, the grandmother of Ina's friend Michael the florist, made a fantastic chocolate cake. Like Martha's, hers came together with a single bowl and beater and was advertised as delicious. Who was I to argue with Ina? So the next family event rolled around, and out rolled Beatty's cake. Now this recipe was deemed supreme, and all others were said to pale in comparison. "What about Martha's?" I asked my family. "This is better." They replied. The problem was, I know better than to trust my family and friends. See, I know them. They are a fickle, fickle bunch. Easily swayed by the power of chocolate, give them a slice of homemade cake and they will pretty much say whatever you ask them to. They know cake that is in front of you will always be far superior than the cake that has long been eaten. I had to find out for myself. It just so happened that recently I was contemplating the task of a cake for an annual family picnic. It was to celebrate a six-year-old's birthday, and when I asked for particulars I was told "chocolate, no nuts." Armed with this instruction, I decided that purity was the way to go; chocolate upon chocolate. And layers. Lots of layers. What child (or adult for that matter) doesn't catch their breath just a little at the sight of a towering slice of birthday cake? I was perusing recipes when I realized the opportunity at hand. I could finally settle my chocolate cake conundrum - whose cake was better, Ina's or Martha's? I did the math - one single layer 9"x13" cake (or double layer 9") serves about 16 people. If I took two recipes for cakes that size, I could easily serve my 30. Then I ran into a problem. If I did one layer of each cake, they may bake up to different textures or colours. That would not work. As anyone who knows me can tell you, I am a stickler for consistent results in baking. But I did not want to pass up this chance to finally try these cakes side-by-side. I considered my options and came up with an unorthodox plan. Make each recipe to the letter, or at least to the letter of the notes I have made over the years. Take one 1 1/4" ice cream scoop of each batter and bake until done in a miniature muffin pan. Take the rest of the two batters, combine them, weigh them, then divide them evenly between three 9"x13" pans for baking. I would have two pure testers to compare, and three identical layers for the picnic. It was just crazy enough to work. And, well, require a heck of a lot of dirty bowls and two nights of staying up well past my bedtime. And yes, I am fully aware of my obsessiveness. But it was so worth it. 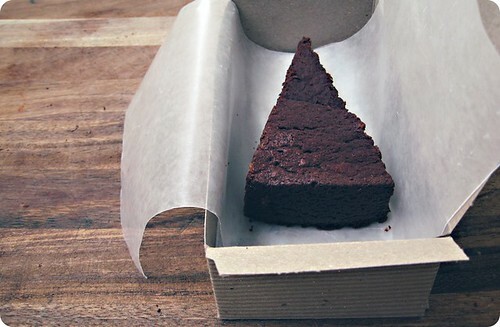 Battle chocolate cake has a winner - Martha*. I wish I had taken a photograph of the miniature cupcakes, but it was later than I would like to admit and there was no way I was pulling the camera out at that hour. Take my word for it, Martha's baked up with a beautiful, glossy-smooth crown and sprang back jauntily to the touch. Ina's was slightly more reticent to recover and flatter on top - a trait helpful in layer cakes, but for a cupcake it looked a little depressed. However, the dark, peat-like colour of each was strikingly similar when compared, as was the crumb. 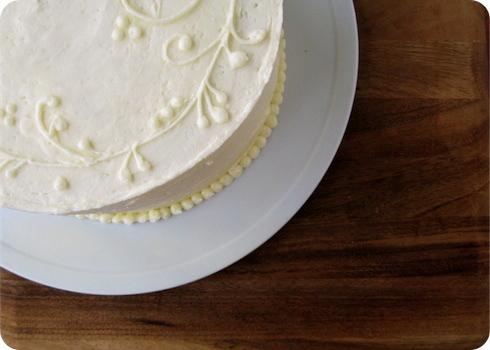 Both cakes boasted a texture that was well-formed, open and moist. If I was pressed to note a difference, Ina's was ever so slightly more moist and delicately-elastic to the tongue. And now the taste. While Ina's did have a prominent cocoa flavour balanced by a subtle coffee undertone, Martha's was somehow more intense, without being overbearing. I could not put my finger on it, but there was something that gave the latter more character. I am sorry and mean no offense Beatty, but something about your cake (while exceedingly tasty) was a smidge reminiscent of a boxed cake when put up against Martha's. Truly, Ms. Stewart's was that good. It was richer, deeper, chocolateyer. I found it was every -er I could hope for. I knew it was not a good idea to listen to family members on a chocolate high. Sometimes due diligence, along with a bunch of eggs and a box of cocoa, is the only way. * Some commenters are surprised at Martha's win. To be frank, I was too; I love Ina's cake. Upon reflection, I wonder if Ina's was a victim to its texture; its light sponginess melts in the mouth, while Martha's edge in structure allows it to linger. In short, you simply have more of an opprtunity to taste the latter. It should be noted though, that I did alter Martha's original recipe (see below), so the victory is subject to a condition. For those wondering what the layer cake was like after I combined the two recipes, it was sinfully yummy. The layers baked up exceptionally even, but their size and tenderness did make them a somewhat delicate to handle. I am fairly sure that the number that ended up at the event was somewhere closer to 50, and the cake served the crowd handily. Everyone came back with glowing reviews. I would almost hazard to say the cake was better than Martha's cupcake, but I am scared to start down that slippery slope. Goodness knows, I can't make a behemoth like this one for every event, now can I? With results like this though, I won't say I'm not tempted. You will note I have not included the recipe for the frosting, because that research is still ongoing. 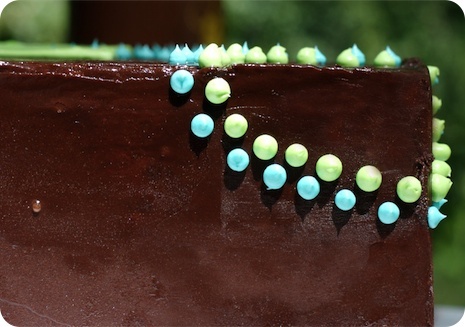 In this instance, I used a loose adaptation of a few recipes for chocolate buttercream between the layers, covered with an improvised ganache smoothed over top. From Martha Stewart's Baking Handbook (Clarkson Potter, 2005). As the recipe is subject to copyright, I have only included my notes here. However, a quick search does find it published online (not through the official site, not the one that begins with 3/4 cup unsweetened cocoa powder). In lieu of milk alone, I use 1/2 cup sour cream plus 3/4 cup milk. Alternatively, I have had success swapping in some buttermilk. As many may remember, I am an addict when it comes to espresso and chocolate in combination; so I use about 1/4 teaspoon of espresso powder dissolved in the warm water. If espresso powder is unavailable, I recommend at least 1/2 cup of prepared coffee substituted for the same amount of water (combined with enough warm water to meet the recipe's specification). If using kosher salt for baking, I sometimes will stir it into the liquid ingredients instead of sifting it into the dry. This way you ensure that it is fully dissolved.